When it comes to making money with blogging, I am not the only one who is making money online. Keeping this thing in mind, I have designed a new program for bloggers, SEO, and internet marketers who want to make money online by offering blogging and blogger outreach services. The beauty of this program is that it is open for all. There are 300+ bloggers who are working with me on various projects on daily basis. I know there are thousands of bloggers who are looking for opportunities to make money with blogging and guest posting. Here I am going to offer you all a program called, “Make Money by Blogger Outreach” and “make Money with guest posting”. Now you want to know what this program is all about? This is a program which is similar to any sponsored post network. It works similar to odesk or blogmint. All you need is a quality blog on any niche to join this program. I will be sharing various projects on regular basis in Blogger Outreach section of eAskme. You need to fill the details to get the work or I can say the bid to get the work. Only qualified blogs will be awarded the project and earn money after successfully completing the project. How to join Make money with Blogger Outreach program? 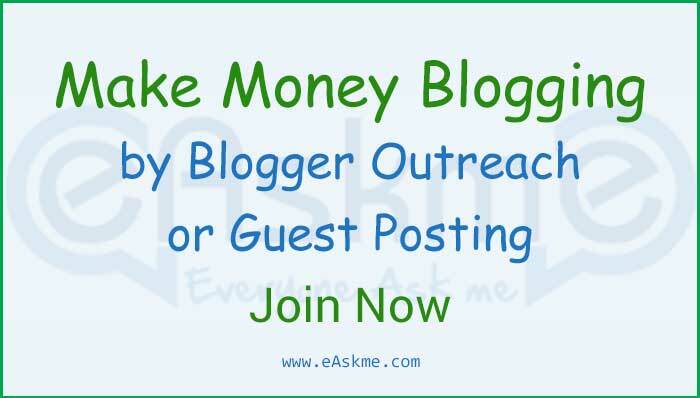 To make money with blogger outreach or guest posting program, you need to fill the below-given form and follow steps. Loading... Once you register for this program, you will start getting notifications or emails about the projects I will launch or share on eAskme. All you need is to bid on those projects to get the job. You will be paid after successfully completing the project, means final approval from the client. So what are you waiting for? Just fill the form and be part of this program to improve your chances to make more money with blogging. Still, have any question, feel free to ask me on Facebook.